Thanks to our know-how in the industry, we as a Supplier, endeavor to deliver nothing short of brilliance to our customers. 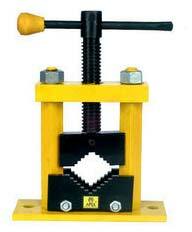 Apex Pipe Vice on offer is processed making use of top notch material by our vendors. Under guidance of adept experts, we manufacture best quality pipes in different capacities like 40, 50, 75, 100, 150 mille meters. It is temperature resistant, made of steel and has a replaceable jaw working efficiently between two steel bars.